This is the Ultimate Tailpainting Tool. Tail painting is the most popular way of detecting heat in cows. So why does it still take so much time and effort? With the Agrify Tailpainter, you can tail paint a cow in a few seconds, from a place that is easiest and safest for you. One tool, three configurations to suit your individual needs. 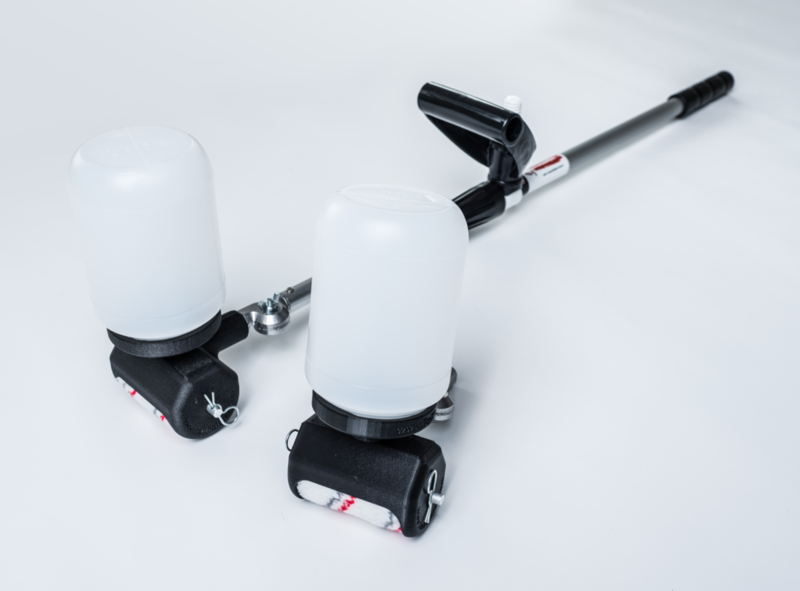 Our unique gravity fed roller design applies tail paint for optimal coverage of the cow’s tail, with no mess! Have a few seconds to spare during milking? Watch Liam tailpaint 6 cows in 18 seconds from the safety and comfort of the floor of the his milking parlour pit. No jumping up and down, no gantry to take your knee out. Maybe it makes more sense for you to tailpaint in the crush. No problem, this is the tool for you. Watch Liam tailpaint 4 cows in 15 seconds in the crush! Perhaps you have a few seconds to spare after getting the feed down. Watch Liam tailpaint 6 cows in 18 seconds while feeding. This is a tool that can earn you money by helping you tailpaint more effectively and without upsetting your cows. Because it is so simple to use, you’ll keep your paint topped up, and be confident when she’s on heat. This leads to more compact calving, detecting fertility issues sooner, and ultimately gets your entire herd into peak production as quickly as possible. All without needing to invest thousands of Euro on new-fangled electronic gizmos that may or may not work, and may require more bovine testosterone than you’d like to have hanging around the farm! We’ve tested the Tailpainter with a water-based paint such as FIL Detail, Dulux, and Castle paint brands, or an oil-based paint such as FIL Tell Tail or Allflex Flexmark. 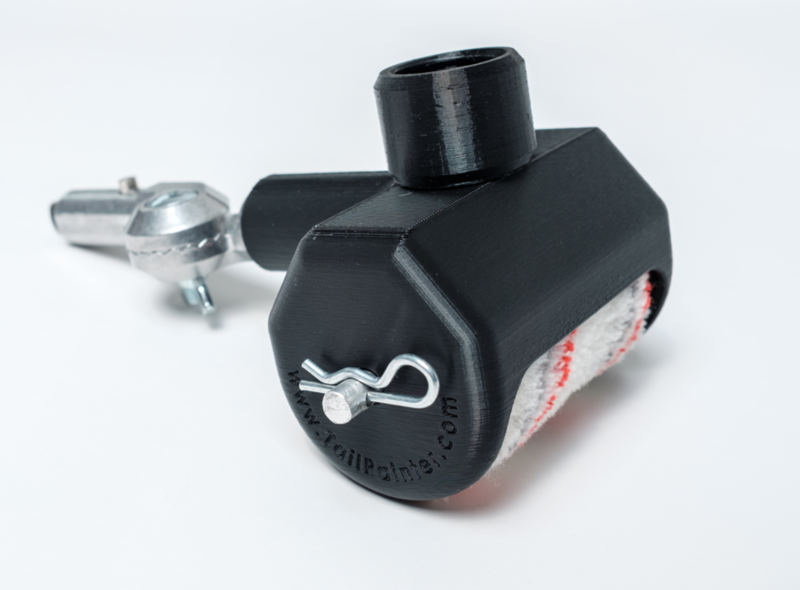 Included with every Tailpaint Applicator is a bottle adapter that fits most popular 500mL and 1L tail paint bottles. If you would prefer to use paint out of a can, we offer a separate 1L refillable container that attaches to the Tailpaint Applicator. That said, because it is so painless to keep tail paint topped up, we recommend using a quality water-based tail paint such as FIL Detail, Dulux, or Castle. Why? Apart from environmental considerations, water-based paints are far easier to clean! Contains one tailpainting handle, one applicator, and a bottle adapter that fits most popular 500mL and 1L tailpaint bottles. Tail paint not included. The Basic Kit plus a 1L refill bottle and adapter. Tail paint not included. The Basic Kit plus a second Applicator with bottle adapter. Tail paint not included. Refill Kit plus additional applicator and 1L refill bottle with adapter. Tail paint not included. Who is this Liam guy anyhow? Liam is a dairy farmer based in Ballydesmond, Co. Cork and is also an AI technician. He noticed that the farmers who were tailpainting efficiently got excellent submission and conception rates but this was a very small percentage of his AI customers. The majority of his customers either didn’t have the facilities, the time, the help or the physical ability to tailpaint as often as they would like, thus reducing their accuracy in heat detection. This, along with his own problems tail painting efficiently in his own herd, highlighted for him the need to invent a solution to his own and other farmers’ tailpainting problems.